Born in Toronto, Ontario, Canada. Branston had many achievements including being a founding member of the Toronto Stock Car Racing Club and being inducted into the Canadian Motorsport Hall of Fame. In the late 1940s and 1950s Wallie became a popular figure and consistent winner on local Stock Car Racing Tracks. 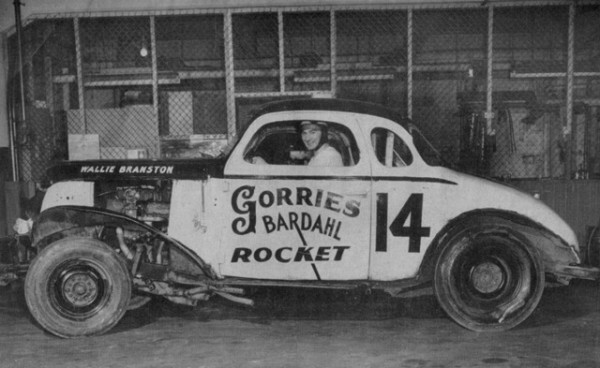 He was one of the first stock car racers in Canada to have major sponsorship, driving a series of Gorries and Bardahl sponsored stock cars. He raced on both dirt, pavement, road courses and ovals. He raced sports cars and was a rally driver. A fan favourite at Pinecrest and the CNE Speedway, the Star once announced in a headline, “Branston is matinee idol of CNE stock car addicts.” After winning his fifth race early in the 1953 season, the Star’s Jim Proudfoot recounted how it took 20 minutes for the victorious driver to extricate himself from the winner’s circle, as he signed autographs, shook hands, and accepted congratulations. He was also the “human battering ram” on the daredevil “Canadian Aces” team that went up against the Ward Beam Hell Drivers when that barnstorming troupe made its annual stop at the “Ex” in August. In 1954, he raced in a Nascar Cup Series event at the Monroe County Fairgrounds at Rochester, N.Y., his contest ending on lap 52 of 200 when he crashed his ’53 Oldsmobile. The race was won by the legendary Lee Petty. When his racing days ended, he spent fifteen years as the Starter at Mosport. From 1961 until 1975, during the glory years when sports cars, the Can-Am, the Trans-Am, Formula One, U.S. Auto Club stock cars and just about everything else you can think of raced there, Branston was front-and-centre, waving the green flag to start races and the checkered flag to signal the end of competition. It was hard to miss him. Attired in black dress pants, white shirt, yellow bow tie and red sports jacket, he pretty much stood out. And his high leaps while waving the checkers are the stuff of legend, including this legendary photo from 1967 as he gave the checkered flag and the Grand Prix win to Sir Jack Brabham in a downpour on the winding course at Bowmanville, Ont.. Throughout his life an all-’round booster of the sport, Branston was a longtime director of the Canadian Motorsport Hall of Fame, and in 1997 was inducted himself. On November 7, 2013, Wallie Branston, passed away at age 90.